As construction proceeds on a dense mixed-use development to the west of MB Financial Bank, West Towners may have noticed a tiny project at the bank itself. 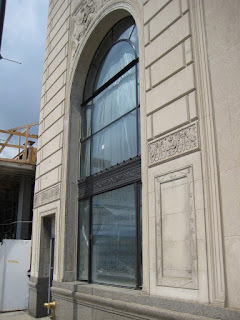 Last year the limestone infill at the arched west window was removed. More recently restoration began in earnest behind a barricade. Now complete, the original cast iron window frames are again visible, reglazed with energy-saving insulated glass. According to the city’s Landmarks Division, all of the windows on the south side of the bank and two on the east eventually may be restored to their original elegance. Alderman Flores deserves much credit for landmarking the bank, which made extensive financial incentives available to its owners. These incentives become tangible benefits to the community through restoration projects like this. This is a very good omen for the Polish Triangle!